Learn about Thanos, the Infinity Stones, and more. With Avengers: Infinity War hitting theaters, you might want to read up on the inspiration for the big Marvel film, so we’ve assembled this list of the essential comics to read based on key elements from the movie. If you want to know more about the Infinity Gauntlet, Thanos, the attack on Wakanda, and the fractured state of the Avengers, then check out these reads. If you only read one book on this list, this is the one. The definitive Thanos story and one of the most eye-popping stories in Marvel Comics’ history. Jim Starlin and George Perez’s six-part cosmic masterpiece explores the motives and machinations of Thanos with deft plotting, unfolding the Mad Titan’s quest for power like a horror story, culminating in a desperate all-out assault by earth’s heroes on a giant, intergalactic monument to death Thanos has crafted to win the heart of his true love, the personification of death. It’s even bigger and wilder than it sounds, but the story’s genius is in the little details that have always set Starlin and Perez apart. From the uniquely odd characterizations Perez gives to even the grandest conceptual being to the grandiose monologues Starlin writes for Thanos, there’s no shortage of great moments. Based on what we know about Infinity War, this is the source material it will draw from most heavily, and small wonder. 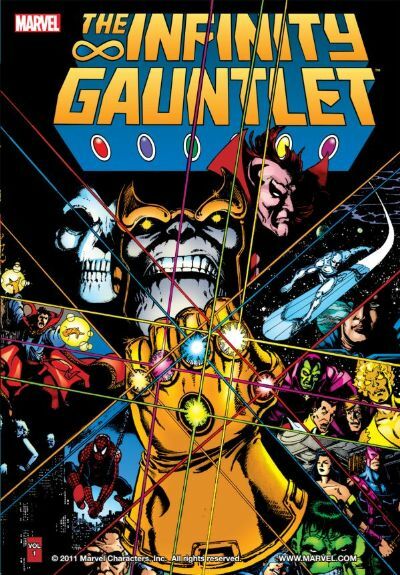 There is an actual comic series called Infinity War that followed this one, but the less said about it the better. This remains the bar not just for great Thanos stories, but for Marvel’s cosmic adventures in general. 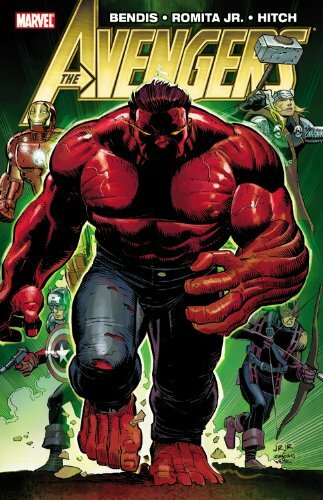 Brian Michael Bendis and John Romita’s run on Avengers really picked up steam in this arc, which has the team facing off against the Hood — a generally containable threat who becomes considerably more dangerous when he starts collecting the Infinity Gems. This leads to a serious external challenge, made far more difficult by the fact that the Avengers are suffering from an internal breach of trust. Yes, the Infinity Gems (or “Stones” if you’re going by the movie’s lingo), those mysterious, all-purpose MacGuffins of immense power take center stage here. In past stories, the Infinity Gems have suffered from being a little vague in their exact capabilities. Bendis wisely uses this story to show off their individual capabilities a bit here, all while picking at some old wounds between the Avengers. While the movies have toyed around with what these gems actually can do (think of the big finale in Guardians of the Galaxy or Vision’s origin in Age of Ultron), this run is your best bet for getting acquainted with the individual gems and wrapping your mind around the extinction level threat posed when they fall into the wrong hands — something that seems to happen an awful lot in these comics. Few modern comic book writers do grim cosmic narratives better than Jason Aaron, and his apocalyptic style is served exquisitely by Simone Bianchi. 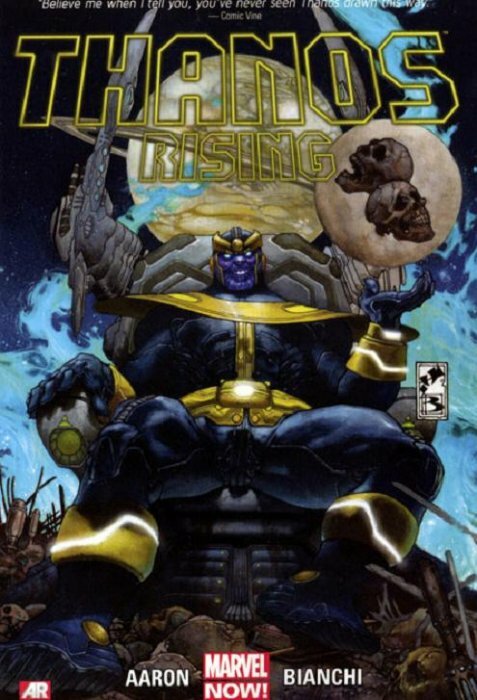 Together, they make Thanos Rising an origin story for the ages, delving not just in how Thanos came to be public enemy number one in the Marvel Universe, but why, adding layer upon layer of deft psychological characterization to their central figure, showing that the nickname “the Mad Titan” is no misnomer. The risk with any story that lays bare the full origin story of these characters is that a lot of the mysteries that made them fun get stripped away. Aaron and Bianchi intentionally subvert this by giving answers that lead to even more questions about just who Thanos is and how he sees himself and the world around him. Bianchi’s art does tremendous work here. In lesser hands, Thanos’ purple skin and armor can look a bit silly, but it’s nothing of the sort here. Both he and the people he encounters (space pirates! Alien prostitutes!) take on a sense of dire gravitas. But nothing is more interesting than Thanos himself, who becomes in turns a more sympathetic character and a more horrifying one than could have been imagined. Reality Check: Was Facebook data’s value ‘literally nothing’?